The son of Sudanese and American parents, Amir Mohamed was born and raised in the United States capital city of Washington DC, spending hot summers in Khartoum learning Arabic and swimming in the Nile. Growing up amidst the sounds of New York hip hop, his father playing Oudh, Go-Go, and gospel, Amir took his first steps as an MC producer in the analogue basement studio of his legendary neighbour, Garry Shider (Parliament Funkadelic). Convincing his entrepreneurial father that he too had business acumen, Amir laid the check from his first commercial release on the kitchen table before his 21st birthday and never looked back. Though Oddisee has gone on to perform with The Roots, produce for Freeway, Jazzy Jeff, Little Brother, De La Soul & Nikki Jean, and has MC’d on production from Flying Lotus, Hudson Mohawke and Kev Brown, his proudest moment was the birth of his critically acclaimed group Diamond District with fellow Washingtonians X.O. and yU. 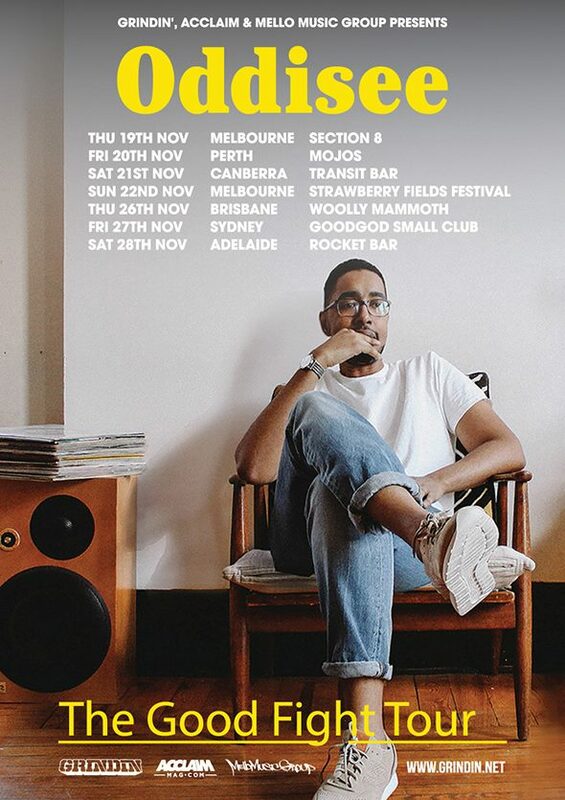 Known in the music industry for his independence, Oddisee consistently debunks the scatterbrained artist myth – doing everything from booking international tours to photography to marketing and promoting himself and even other artists. He now works as both artist and consultant with Mello Music Group, one of the foremost emerging independent labels to take advantage of the digital revolution to build a successful business. His new album “The Good Fight” has been added to Double J and FBI Radio featured playlists and in a landscape overrun with abstract indulgence and shallow trend-chasers, the Prince George’s County, Maryland artist has created a record that reminds you that it’s music before it’s hip-hop. For Oddisee, “The Good Fight” is about living fully as a musician without succumbing to the traps of hedonism, avarice, and materialism. It’s music that yields an intangible feeling: the sacral sound of an organ whine, brass horns, or a cymbal crash. It’s a meditation on our capacity to love and the bonds binding us together. It’s our ambition and greed warring with our sense of propriety – a list of paradoxes we all face when living and striving. “The Good Fight” acknowledges the stacked odds, but refuses to submit.